Social media is making Trump look bad, and the president is fighting back, threatening to prosecute Google and going after Twitter as well, with economic advisor Larry Kudlow telling Bloomberg that the administration is "looking into" whether Google suppresses positive articles about Trump. Exactly how they are “looking into” it, no one knows, but Trump has accused Google of manipulating search results to make him look bad and rigging the search engine “so that almost all stories & news is BAD”. Then, it was followed up after a meeting in the Oval Office with FIFA President Gianni Infantino. In a statement, Google’s spokesperson said the company’s goal was to make sure users got the most relevant answers to their queries within seconds, and it was about speed, not petty politics. “Search is not used to set a political agenda and we don't bias our results toward any political ideology…We continually work to improve Google Search and we never rank search results to manipulate political sentiment." Related: VCs, IPOs And ICOs: Which Will Prevail? So, it’s the algorithm that doesn’t like Trump, and it is based on a plethora of factors. At the moment, searching for “Trump news” brings up stories from a wide-range of sources. They include positive stories from Fox News, the president's favored cable network, more critical pieces from CNN, and a slew of stories from various other business-oriented publications. Of course, it’s not without a grain of truth … In July, unidentified activists influenced Google’s algorithm to ensure that when the word “idiot” was typed into Google’s image search, Trump would be the first result returned. It’s possible, according to some speculative reports, that Trump’s attack on Google was prompted by a recent report by PJ Media—a conservative news website--which claimed that 96 percent of Google search results for the word "Trump" showed left-leaning publications. But there may be other elements to the timing, too. All three social media monoliths—Google, Twitter and Facebook—are scheduled to testify before Congress next week about censorship and election meddling. Last week, social media giants moved to ban hundreds of accounts, groups and pages linked to Russia and Iran in a move meant to protect against political interference. Google has banned more than 80 YouTube channels allegedly connected to attempts by Russia and Iran to spread misinformation, while Facebook has suspended hundreds of social networking and Instagram photo-sharing accounts, deleting a total of 652 accounts linked to Iran and Russia. Twitter has suspended 284 accounts believed to be engaging in coordinated manipulation. Not everyone sees it in the same light, though. Right-wing commentators smell censorship in this social media purge, particularly after Youtube, Facebook, Apple, Pinterest and Spotify banned right-wing conspiracy theorist Alex Jones from posting content. They removed Jones’ podcasts, pages and other content, citing violations of policies related to hate speech and harassment. But what Trump is asking for is censorship itself—censorship of the way a search engine generates results related to him. So, at the end of the day, everyone wants a type of selective censorship. 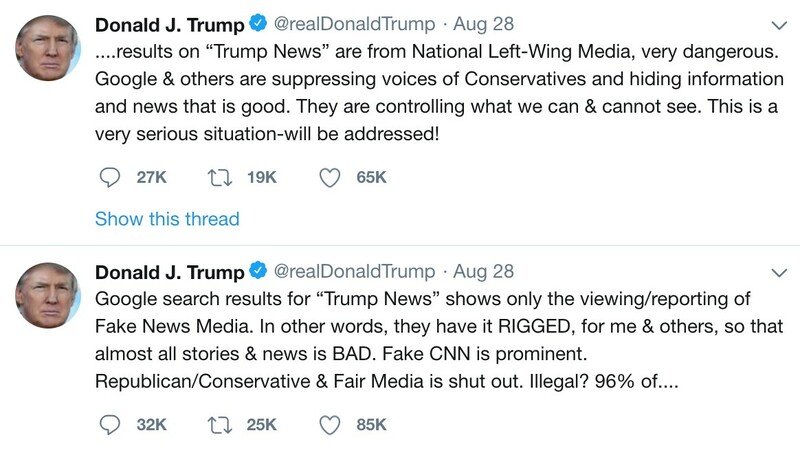 It was already debatable whether banning Russian and Iranian-linked social media channels was a slap in the face of free speech, and now the White House is looking for friends-only search results and tweets. Is Fear Of Missing Out Fueling Market Growth?